LightKulture.com, a leader in performance, decorative lighting, is pleased to offer BLACKJACK Lighting by Stephen Blackman. For his BLACKJACK brand, I am especially drawn to his new LED suspension series Starburst, Swirl and Corsaire. These three fixtures represent contemporary lighting blended with retro modern elements. 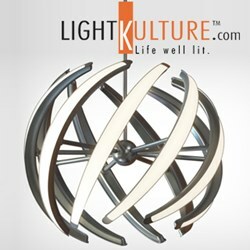 LightKulture.com is pleased to offer BLACKJACK Lighting. BLACKJACK Lighting is the brainchild of Chicago based designer Stephen Blackman, a leading American lighting designer. “Stephen has been commissioned by some of the top lighting manufacturers to create lighting works of art, which embody his sense of elegant, understated practicality. I am pleased to support this new endeavor of stylish, forward-thinking LED lighting,” noted Susan Inderbinen, President of LightKulture.com. A rare combination of expertise, ingenuity and artistry goes into every BLACKJACK design. Particularly outstanding are the collection of LED pendants and chandeliers. Blackman’s mission is to manufacture the next generation of performance decorative lighting. Distributed from the East Coast by Illuminating Experiences, BLACKJACK is ready for prompt shipment. Architects, Interior designer, specifiers and homeowners now have access to this creative expression of contemporary LED lighting. Launched in 2013, Blackman wanted to develop an entire brand under his own label. Three exciting new LED suspension fixtures just being released to the market are Starburst, Swirl and Corsaire. The Starburst LED is a 29.5” diameter, dimmable, 24 light, frosted laser-cut light- guides that sparkle in sharp angles. This high-tech interpretation breaks new ground with replaceable LED modules.The Swirl LED Pendant luminous forms are created with highly-efficient LED strips mounted inside metal stampings that dissipate LED heat. The curved lyrical shapes send light in all directions. Swirl is available in 16” diameter (23.6watt) and 23” diameter (38 watt), with a 32” version due this summer. Finally, the Corsaire LED is a 25” diameter, 9 light, 28 watt, glossy plastic pendant available in gloss red, black and white. While the Corsaire has field adjustable cables, the Starburst and Swirl offer various size stem length to increase the overall height of each fixture, depending on the installation. For more information go to BLACKJACK Lighting https://www.lightkulture.com/m-103-blackjack-lighting.aspx. “I have been a fan of Stephen Blackman for many years. Illuminating Experiences Elf series was one of Stephen’s original best selling collections. This has become one of his iconic designs of simple cylindrical glass shapes, that has expanded into a wide range of wall sconces, bath brackets, flush mounts and suspension fixtures. For his BLACKJACK brand, I am especially drawn to his new LED suspension series Starburst, Swirl and Corsaire. These three fixtures represent contemporary lighting blended with retro modern elements. One Starburst or Swirl placed by itself makes a dramatic statement. Using multiple Corsaire’s in a cafe, hospitality or retail space, add crisp light and an element of design to an open space. All 3 ETL approved fixtures are instant-on/off, dimmable, 3000k and 80 CRI,” noted Susan.